I always find it interesting when a pastor “pulls back the curtain” and shows his sermon preparation and sermon notes. 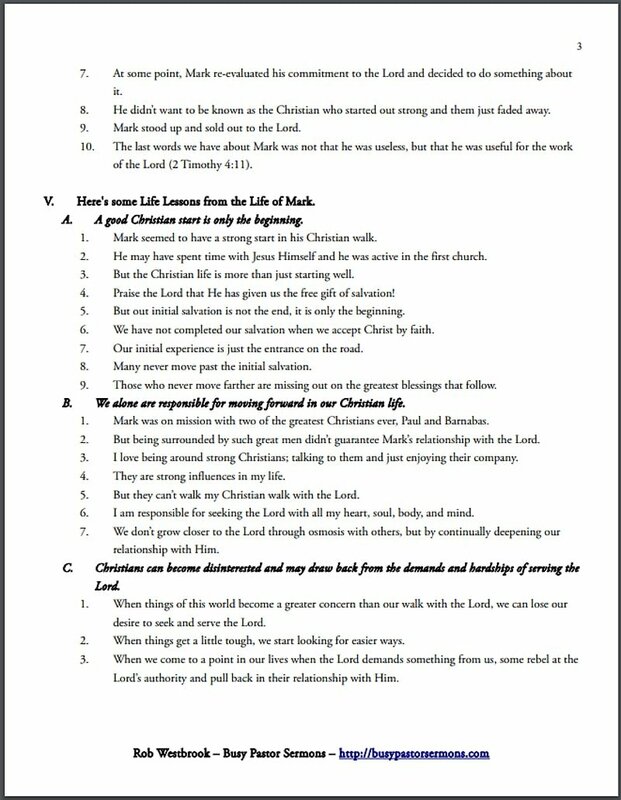 I thought I would do that and give you a glimpse of what I do with an example of one of my sermon outlines. This sermon is titled “Second Chances.” It’s based on the life of Mark. The sermon is topical. This sermon stresses the fact that the Lord is a God of second chances. So many people struggle with their failures. They sometimes think they’ve gone too far. That they have somehow failed so badly God is done with them. The story of Mark is one of failure and redemption. I find it immensely encouraging and I think our people do, too. Not all my sermons are structured exactly like this one. Many of my sermons are more expository in nature. But I do use the basic structure you find here in almost every sermon. There are four pages to this sermon outline. Each page is annotated. Highlights are pointed out and fully described below each page. 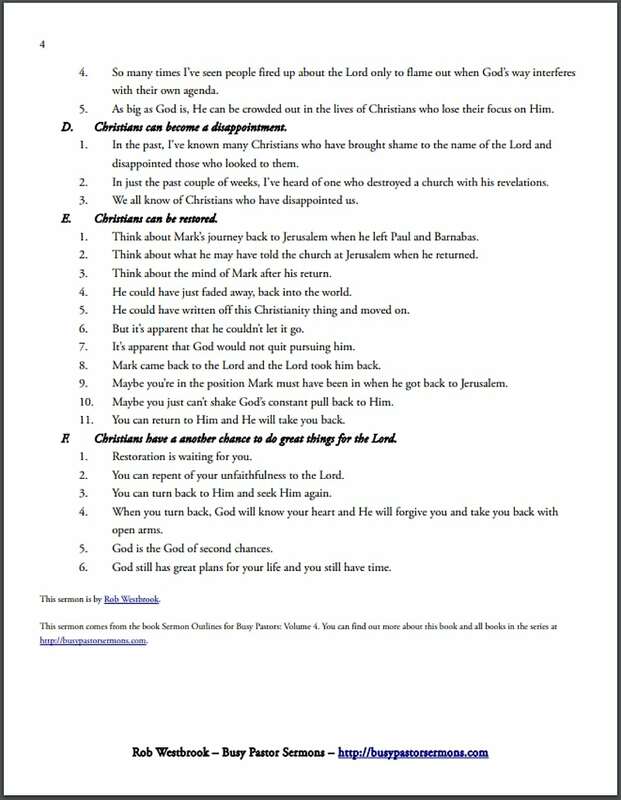 If you want to take a closer look at this sermon outline, it’s available as a free download. You can download it by clicking here. The sermon is also included in Sermon Outlines for Busy Pastors: Volume 4. I hope this helps you out as you prepare your own sermon outlines. I’d love to hear what you think so please leave a comment at the bottom of the page. My sermon outlines always have a title and Scripture reference. However, I rarely announce my titles when I’m in the pulpit unless the sermon is part of a series. When I’m in a series, I’ll use part of my introduction doing a quick review of previous messages in the series. If this is the first message of the series, I like to do a quick introduction to the coming series. For the most part, the title is for my own use. It is a reference point for me in the future. It helps me catalog my sermons for future use. I always include a Scripture reference, even if I’m using multiple Scriptures throughout the sermon. When I refer to more than one Scripture, my heading usually contains the first Scripture I use. However, if there’s one passage that I most focus on, it will be in the heading. My first words are used to grab the congregation’s attention. In this example, I want to get them thinking about a personal situation. I want to raise some questions that plant a mood, a feeling, or an emotion in their minds. Something that will focus them on what is to come. Many times, I use personal illustrations from my own life. I don’t really like to use illustrations from “back in the day” or from people who most are not familiar with. I find people connect better when they hear from my own life. I use my own humorous life events as illustrations quite a bit. (And my life has had some humorous episodes!) You can speak a lot of truth in an otherwise humorous situation. Humor provides people with a connecting point because most people can relate their own situations to the ones I use making fun of myself. Humor loosens up people and gets them into the flow of the message. This is the bridge into the sermon. I feel this is a critical point. I take the illustration or introduction and carefully tie it into the message to come. This helps the congregation tie a real-life situation or event to the Scripture I’m about to open up for them. This is not what some call the “hermeneutical bridge,” where the Scripture and it’s context is brought into our lives today. This is a bridge from real-life into the Scriptures. It’s taking our real-world lives and dipping them into the Word of God. That’s why I consider this critical. I want our people to see how God speaks into every aspect of our lives. We have our illustration, humorous or not, that presents something everyone can relate to. Then we bridge it into the Bible, where we will present God’s answer to the situation. This particular sermon is a topical sermon. That does not mean there’s no Bible exposition. I’m building our topic from Scripture. There’s no other way to build a sermon outline or sermon. With this sermon, I’m using the Scriptures to build a timeline of Mark’s life. I’m starting at what may be the earliest recorded appearance of Mark in Scripture. This timeline will be important later in the sermon when I arrive at the application point. I continue following the life of Mark. I stress the great works of God he witnessed as he traveled with Paul and Barnabas. My focus here is to build up Mark’s early life and his participation in the mission of Paul. He’s a blessed young man. Everything is going well for him in the first years of his Christian walk. The mentality behind point 1 is to paint a picture for the congregation. One that most Christians experience. An exciting early Christian life. Good times. Uplifting events. I want them to relate to Mark. Point 1 is building the story. Good stories are not “good things happened and they lived happily ever after.” Good stories have setbacks that must be overcome. My first four sub-points are the good times before the setback. Now we raise questions. Something happened with Mark. I want the congregation to think about what happened. I want them to relate. So I ask questions. Questions they may have about someone they know. Or questions about themselves. I want to pull them into the story. Questions are an effective way to do that. Whatever happened with Mark, Paul and Barnabas were divided. This great missionary duo was so divided they split up their ministries. What started out so promising ends in the damage of not only Mark but in the damage of others who cared deeply about him. So now we have this problem. It’s a problem everyone can identify with. Everyone has been hurt by someone they were close to. The contrast pulls people in. Is it over for Mark? What happens? Using the tool of contrast is very effective in gaining attention. It helps set the stage for the next point. Technically, I suppose, this could still be point 2. But for emphasis, I placed this section in its own point. I wanted the comeback and restoration of Mark to be front and center. Whatever Mark’s problem was earlier in his life has been conquered. He gets a second chance. Which is the main point of the entire sermon. Christians have second chances. I conclude the exposition with good news. I’ve carried the congregation through the entire arc of Mark’s life. His rise, his fall, and his restoration. I’ve set the table for the application. This is the “hermeneutical bridge.” I feel this is our entire point for preaching. This is where the rubber meets the road for the preacher. Taking God’s Word and showing how God is still speaking today. We take what the Bible says and let it speak today into the lives of our people. This is what differentiates a sermon from a Bible study. Application. Bridging between the Bible and our people’s everyday lives. Notice how the application sub-points closely follow the timeline of Mark’s life. These arcs in Mark’s life that we built earlier now find their natural order in the application. Mark started well. Christians start well. But there’s more to the Christian life than starting. Salvation is the beginning point, not the end. Mark was in the company of two of the greatest Christians in history, Paul and Barnabas. But Paul and Barnabas could not live Mark’s life for him. They could not make his decisions for him. Mark was responsible for Mark. We can be surrounded by the finest Christians we know. We can watch them live their lives for the Lord. But they can’t do it for us. We must assume responsibility for our own lives. We must live for the Lord ourselves. Whatever happened with Mark, he pulled back. He retreated. He ran back to familiar territory. Even with two godly companions, Mark could not go forward. His flame died down. There are times when we retreat. Life gets hard and we lose sight of God’s direction in life. Want to lead into the Easter season with a focused sermon series? People, people we love, care for and depend on fall off the path. It’s not ideal, it’s not what we want to see, but it happens. People sometimes fail us. We fail others. We fail ourselves. Many times, our Christian walk is marked by disappointment. We hurt people. We hurt the Lord. Praise God for His restoration! For grace and mercy. God offers a second chance. Mark was restored. There’s hope for us. For our family members. For our friends who’ve failed us and the Lord. God is in the restoring business. This sub-point could also be a standalone point. It is an invitation. An invitation to restoration. Mark failed miserably and yet he was restored. I may have failed miserably. You may have fallen flat on your Christian face. But the Bible shows us God can restore. So there’s a deeper look into one of my sermon outlines. These are the outlines I actually take into the pulpit when I preach. I use an iPad, where I blow the notes up with a large font size for easier viewing. Of course, as with every sermon, I don’t preach these exact words. I use the notes more as a way of staying on track and not succumbing to chasing rabbits. And I always want to be open to the Holy Spirit’s leading while in the pulpit. I’m curious. Would you mind answering the questions below? How do you structure your sermon outlines? What are your tips for preparing sermon outlines? I’m sure we would all love to hear from you. Share in the comments below.